To complete my series of posts on Photon Platform version 1.2, my next step is to deploy Kubernetes (version 1.6) and use my vSAN datastore as the storage destination. 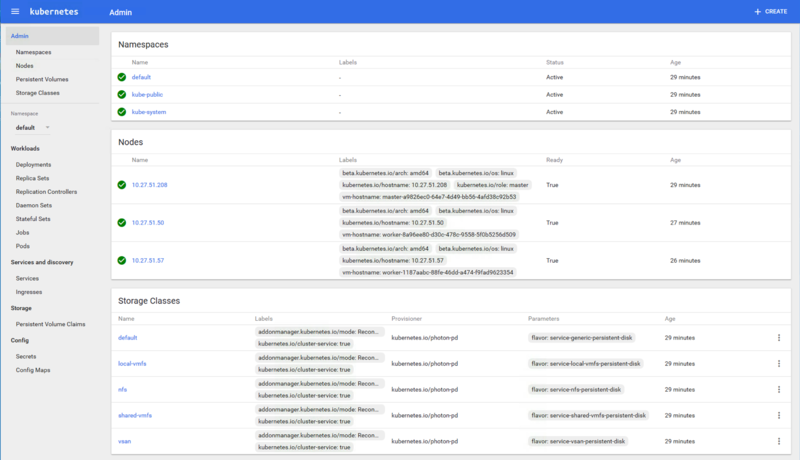 The previous posts covered the new Photon Platform v1.2 deployment model, and I also covered how to setup vSAN and make the datastore available to the cloud hosts in Photon Platform v1.2. This final step will use the photon controller CLI (mostly) for creating the tenant, project, image, and all the other steps that are required for deploying K8S on vSAN via PPv1.2. I’m very much going to include a warts-n-all approach to this deployment, as there was a lot of trial and error. A few things have changes with the new v1.2, especially with the use of quotas, which replaces the old resource ticket. The nice thing about quotas is that they can be adjusted on the fly, but they take a bit of getting used to. Photon Platform v1.2 should already be deployed. You need 3 static ip addresses for Kubernetes (K8S) VMs, a master ip, a load-balancer ip and an ip address for etcd. The network on which K8S VMs is deployed needs DHCP for the worker VMs. You need photon controller CLI installed on your desktop/laptop to run photon CLI commands. Why not use the UI? 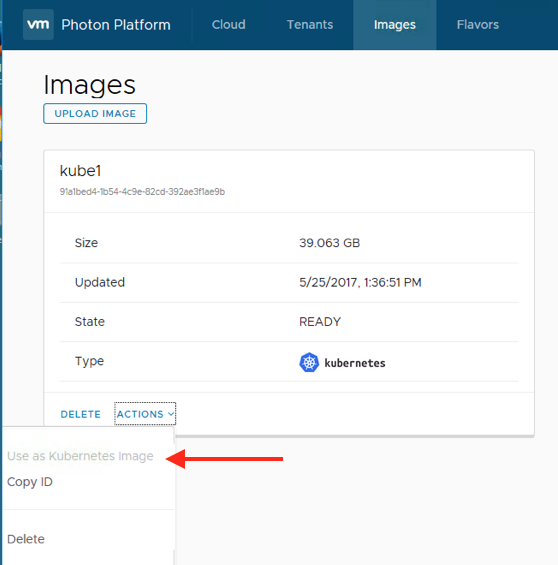 Yes – you can certainly do this, and I showed how to deploy Kubernetes-As-A-Service with Photon Platform version 1.1. Unfortunately there seems to be an issue with the UI in Photon Platform 1.2, where the DNS, gateway and netmask are lost on the Summary tab, so does not complete. I fed this back to the team, and I’m sure it’ll be addressed soon, so in the meantime, the CLI is the way forward (for most of what I need to do). You can get these from the usual place on GitHub. Deploy it to your desktop, as we will use this CLI to complete the deployment of K8S. The assumption is that the K8S OVA has been downloaded locally from step 1. I’ll now push it up to PP using the following command, and check it afterwards. I tried to do this via the photon controller CLI, but it wouldn’t work for me. I’ve also provided feedback to the team on this. It looks like a known issue which will be addressed in the next update of photon controller CLI. Eventually, to unblock myself, I just logged onto the Photon Platform UI, and marked the image for Kubernetes that way. This is pretty easy to do; just select the image, then actions followed by “Use as Kubernetes image”. This next step is needed so that the VMs that run the various K8S containers (master, etcd, local-balancer and workers) can all communicate. We’re basically creating a network for the VMs to use. I simply leveraged the default VM network in this example (which also has DHCP, as some of the K8S worker VMs pick up IPs from DHCP). This network is specified when we are ready to deploy the K8S ‘service’. This step simply defines the resources that go to make up the VMs that are deployed to run the K8S containers. I’ve made it quite small, 1 CPU and 2GB memory. This will also be used at the command line when deploying K8S later on. In this step, I create the tenant, the project and then select some quotas (resources). I said I would show the “warts and all” approach, so here you will see the various errors I get when I don’t get the quota settings quite right. When you create the tenant and project, you can use the –limits option to specify a quota, or you can use the ‘quota update‘ to modify the resources afterwards. I will show an update example later. Let’s create the tenant with some quota. I will set the tenant to have 100 VMs, 1TB memory and 500 CPUs. I will then create a project to consume part of those VM CPU and Memory resources. There could be multiple projects in a tenant, but in this setup, there is only one. I will then set the tenant and project context to point to these. OK – I thought this would be more interesting if I tried some trial and error stuff here. I didn’t spend too much time worrying about whether I got the quotas right, and so on. I simply decided to try various options and see how it erred out. Feel free to skip down to Take #5 if you’re not interested in this approach. Take #1: Most of this command be straight-forward I think. The only thing that might be confusing is the -d “vsan-disk”. I’ll come back to that shortly. However it looks like we’ve failed due to a lack of resources. Note that the command line is picking up the default tenant, project and network. We are specifing the vm_flavor created earlier though. Most of the rest of the command is taken up with the ip addresses of the K8S master, etcd and load-balancer. Take #2: With that issue addressed, let’s try once more. --kind "ephemeral-disk" --cost "storage.VSAN 1.0 COUNT"
Take #3: Let’s try again. 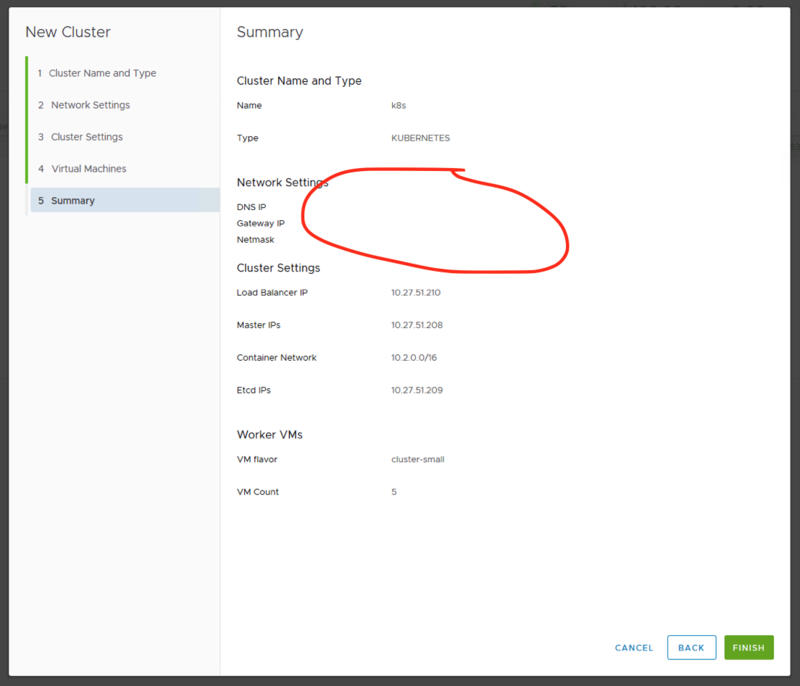 Another quota issue, this time against the newly created vsan-disk. Let’s just bump up the count (and capacity while I am at it). Take #5 – Now it should work, right? Note: the service has been created with minimal resources. You can use the service now. A background task is running to gradually expand the service to its target capacity. You can run 'service show ' to see the state of the service. OK, there were a couple of hiccups. The issue with the UI missing network information, and the photon CLI command issue with ‘enable-cluster-type’. Both of these issues have been fed back to the team. Also, quotas take a little getting used to, but once you are familiar with them, they are far more flexible than the older ‘resource-ticket’. And if I took a little more time to learn about them, I would have had so much trial and error. Having said all that, it is still relatively straight-forward to deploy K8S onto a vSAN datastore via Photon Platform v1.2, even using the CLI approach. Thanks Cormac for educating us. Just wanted to post my observation. I am consistently seeing this behavior where the “worker” fails at creation time but the master, etcd and load-balancer are installed fine and up and running. Sounds like DHCP may not be working. Can you confirm that dhcp is available on the network where the workers are being provisioned? You provide static IP addresses for the master, etcd and load-balancer. It is only the workers that use DHCP. Can you deploy a test VM, and see if it gets allocated an IP address from your DHCP pool. Remember to deply it on the VM network that you have used for K8s, and have set as the default network. I seem to remember that this is the error I got when DHCP was not working. Sorry. My bad 🙂 Yes. I am passing the static IPs of Master, etcd and load balancer. But still I don’t get why I see the MAC addresses of the same VMs (master, etcd and load balancer) showing up in /var/lib/dhcpd/dhcpd.leases’ which was meant for DHCP ?! that’s where I got confused. Yes. I am using the VM Network that I made as the default network. I will now create a test vm to make sure DHCP works fine. Can you please let me know the hard disk size for the WORKER VM ? It is whatever you have defined in the VM flavor that you have used for K8s deployment. In your previous comment, it looks like it is “–vm_flavor service-other-vm”. Created a test vm. Verfied that DHCP is working fine. I am seeing the address allocated from the DHCP pool. thanks. Sure Cormac. Will do. Thanks for everything. I wouldn’t have come this far without your articles and hand-holding. Thanks again. Hello Cormac , i have photon 1.2 and deploy kubernetes 1.6 fail with FATAL_ERROR ..do you know what to check and how to fix this.